In order to understand the different types of hearing loss, it is important to have a basic understanding of how the ear works. Watch this video provided by MED-EL for a good understanding. Is generally broken into three parts; the outer ear, middle ear, and inner ear. The outer ear includes everything from the ear outside the head to the eardrum. The middle ear describes the space and structures from the eardrum to the cochlea (the snail shell structure inside the skull), and the inner ear describes the cochlea with all the structures inside it and the hearing nerve that carries sound to the brain. 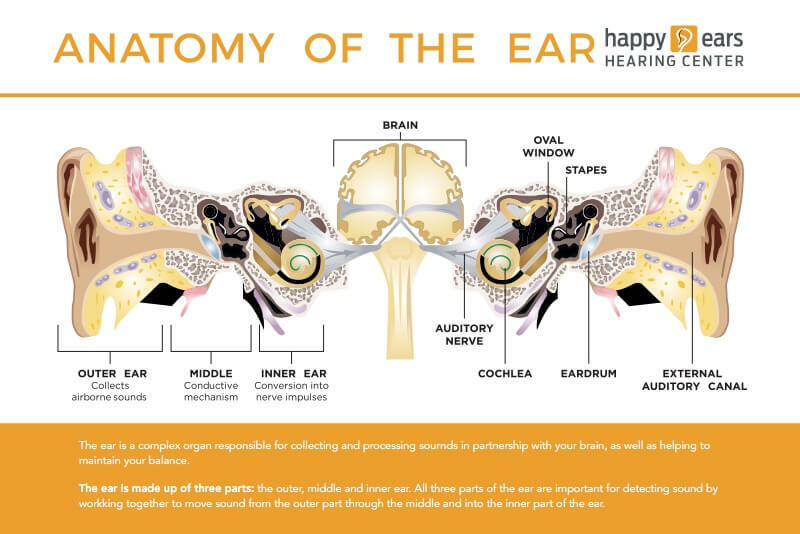 Each of these three parts of the auditory system contributes to hearing and some issues that can arise to cause hearing loss. The Outer Ear: Sound first enters out ear at the pinna – the portion of our ear visible on the outside of our head. The pinna collects sound waves and funnels them down the ear canal to the eardrum. The Middle Ear: The middle ear begins at the tympanic membrane or eardrum. When sound waves from the outer enter the middle ear, they vibrate the eardrum. Behind the eardrum is an air-filled space containing three middle ear bones, the smallest bones in the body. When the eardrum vibrates, it causes the bones in the middle ear to vibrate. If there is a problem in the middle ear, it can restrict movement of the eardrum or bones in the middle ear and dampen the sound that needs to pass through. The Inner Ear: The cochlea – our hearing and balance organ – together with the auditory (hearing) nerve, are referred to as the inner ear. Sound passes to the inner ear by vibrations of the middle ear bones, which are connected to the cochlea at one end. Tiny hair cells within the cochlea convert the sound vibrations into electrical impulses, which carry sound up the hearing nerve to the brain, where it is interpreted as sound and speech.